The patent shows a number of options for holding the water-resistant buds. Perhaps still feeling the sting from so-so reviews of Huawei Watch 2, Huawei may be considering a different approach for its next smartwatch. The company has patented a wearable that can house a pair of Bluetooth earbuds. The patent lays out a number of different storage options, including attaching the buds to the watch band magnetically or in a small case. The watch could also store the water-resistant earbuds in capsules with a spring-release mechanism affixed to either side of the watch face. The World Intellectual Property Organization granted the patent (which LetsGoDigital found) last week. It's a nifty idea, especially since you probably want to keep your earbuds somewhere they're easy to find. 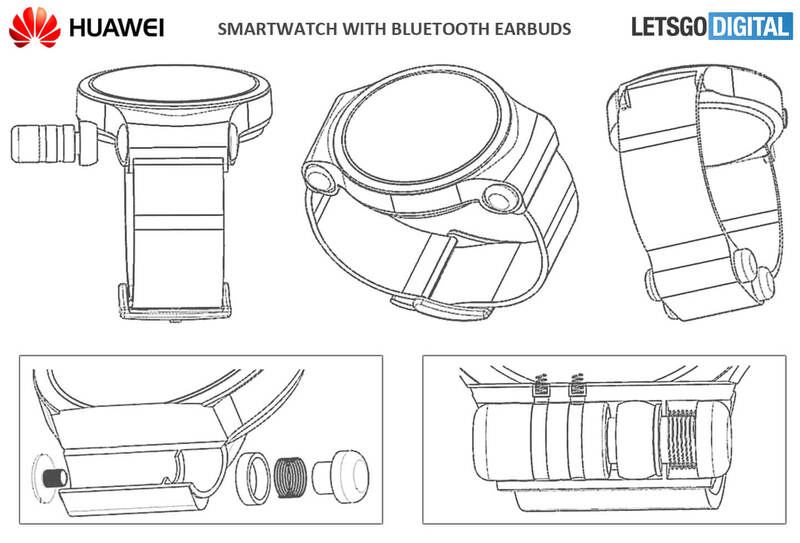 However, a patent is not a guarantee that Huawei will release a watch like this. A couple of months back, the company also received a patent for a gaming-focused smartwatch, so Huawei Watch 3 could store earbuds and let you play games. Or either. Or neither. We'll find out at some point, perhaps at next year's Mobile World Congress.